Amazon has opened their marketplace for third party manufacturers who can sell their goods on the popular online shopping site. Shipping and handling fees are usually added to third party items sold on Amazon, which can increase the price of the item significantly. Most items sold by Amazon directly qualify for free shipping, either directly, or indirectly if a certain threshold is reached. Third party retailers on Amazon may use different shipping providers and different shipping methods. They often do that to cut down the costs of shipping the goods to the customer. This may be problematic if unreliable shipping providers are used. Some users because of this may want to only buy first party sold products on Amazon shopping sites. And while that's possible manually, it requires paying attention to the merchant listing on Amazon item pages. Amazon lists who is selling the item. Items sold by Amazon are listed as such, while items sold by third party merchants list the name of the merchant there. Shipped and sold by Amazon is a Firefox extension that filters out all items that are not sold by Amazon directly. The extension works on Amazon.com, Amazon.co.uk, Amazon.de and Amazon.fr. Filtering out items may have consequences on item availability on Amazon. Items that would otherwise be available may be filtered out so that they cannot be purchased on Amazon as long as the filter is on. It happens quite often though that Amazon and third parties both sell the item on Amazon. 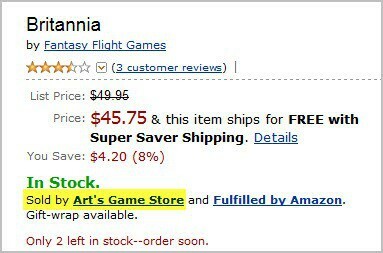 The extension in this case makes sure that the item sold directly by Amazon is displayed to the user. The extension needs to be activated with a click on its toolbar item. Some Firefox users may not see the icon by default. If that's the case, they need to right-click a blank spot on a toolbar, select customize from the context menu, and drag and drop the sold by Amazon icon to one of the browser toolbars. A click on the icon activates it, another deactivates the filter again. Firefox users can download and install the add-on at the official Mozilla add-ons repository. There’s a much simpler way to accomplish this. On every page on Amazon showing search results, there’s a checkbox on the left side labeled Free Super Saver Shipping (or Prime Eligible if you’re a Prime member). If you tick this box, you’ll eliminate all items except those sold by or fulfilled by Amazon. Unfortunately, neither method works for me. There are plenty of 3rd party items eligible for Super Saver both on amazon.com and .de, just try something popular like “Galaxy S2 battery” or “Galaxy S2 Akku” in German. The extension doesn’t work at all on amazon.de (filters all Amazon sold items, too) and gives random results on amazon.com. Thanks for the review though — once it works properly, I’ll use this add-on all the time! Rainer, I tested it briefly on Amazon.com and Amazon.de and it filtered out third party items for searches I did. All Super Saver items on Amazon are fulfilled and shipped by Amazon. The point of the article was to avoid third-party shipping charges, so what difference does it make whether an item is sold by Amazon as long as you get the free shipping and a reliable shipping carrier? Mike, you are right, it’s about reliability, and I may have to rethink my approach. So, what about warranty claims and safety from fakes? Of course I bought from marketplace vendors before but nothing as popular with counterfeiters as batteries, for example. I have met quite a few good marketplace vendors, so I’ll use the filter sparingly after all, but for batteries and the like it’s certainly a good idea. Great that it is now working out for you. Thank you for the recommendation. But i come across another firefox add-on https://addons.mozilla.org/en-US/firefox/addon/discount-finder-toolbar/, which is more helpful. You can filter products by merchant (amazon, 3rd party sellers), shipping (prime, free), discount, price, ratings. You can also search international shipping eligible products, outlet, subscribe & save, 4-for-3 promotions. Check it out.